Many people are said to have had hardening of the arteries just before death. This hardening is caused by an excess amount of calcium in soft tissue, including veins and arteries. The technical name for this condition is called atherosclerosis, and not only is blood flow more restricted, but the possibility of a blood clot is more likely. Excess calcium in the body causes most of the blockage of veins and arteries, sometimes called plaque, so you need to avoid taking excess calcium. One should never take calcium supplements or foods supplemented with calcium; there are already large amounts of calcium in dairy products. Calcium in the bones is necessary, but excessive amounts of calcium are deposited in soft tissues, form kidney stones, and cause partial artery blockage. Partial artery blockage leads to high blood pressure. Calcium works well with magnesium, as magnesium will assimilate calcium. If you take sufficient amounts of magnesium daily, you need not worry about calcium deposits forming in soft tissue. Approximately 68% of people are deficient in magnesium, primarily because of food grown on mineral deficient soil. Thus, magnesium supplementation is recommended. One may take magnesium orally or transdermally. For most people, including myself, I cannot take more than ~400 mg/day without having a problem with loose bowels. There are different magnesium compounds with different levels of assimilation in the body. The best magnesium compound is magnesium taurate, but it is expensive and hard to find. Magnesium oxide is inferior and not well digested. Magnesium citrate is a good compromise. A natural solution is to take six almonds per day; almonds contain both magnesium and calcium, with a higher magnesium/calcium ratio than other nuts. Also good are Brazil nuts, which are also high in selenium. Take no more than three Brazil nuts per day. To take magnesium transdermally, you simply spray magnesium anywhere on your skin. You can make a magnesium spray yourself by first purchasing a plastic hair spray bottle usually found in beauty supply shops, and sometimes in pharmacies. Purchase a pound of magnesium flakes, dissolve them in distilled water, and put into a spray bottle. I recommend dissolving eight tablespoons (111 grams) of magnesium flakes in 3/4th of a quart (800 ml) of distilled water. The magnesium flakes can be purchased online from a health shop or eBay. The distilled water is found in most supermarkets for usage in irons. Spray topically with six sprays, and you will absorb approximately 680 mg of magnesium. You can absorb much more magnesium transdermally instead of taking pills, as pills can cause loose bowels. Some have the luxury of time and a bathtub. A simple way to absorb very large amounts of magnesium is to put bath salts containing magnesium into a hot tub. You won’t believe how relaxed you can feel. This therapy is also great for aching muscles. Olive leaves minimize the problem of atherosclerosis, as they dilate blood vessels. At least they will keep your circulation going until you can dispose of the excess calcium. Olive leaf tinctures are available online. To clear out your veins and arteries more quickly, take niacin (Vitamin B3, nicotinic acid – the flushing kind), potassium iodide, and olive leaf tincture. I take 100 mg tablets of Solgar Brand Vitamin B3, niacin). Avoid too much coffee, chocolate, or non-herbal tea, as caffeine constricts blood vessels. The potassium iodide is in sufficient amounts in Lugol’s iodine, which we offer as Hormone Catalyst. Radiation protection pills are pure potassium iodide. Cayenne pepper is also good for circulation and comes in different heat strengths; the strongest one would be most effective. Ginkgo biloba and Ginger cannot be taken with blood pressure drugs. I strongly discourage the use of any drugs for any purpose; they are ALL poisons in the final analysis. Are you a vegan or vegetarian? If you are too alkaline, there would be a tendency for calcium to accumulate in soft tissue as it is used to alkalize the body. 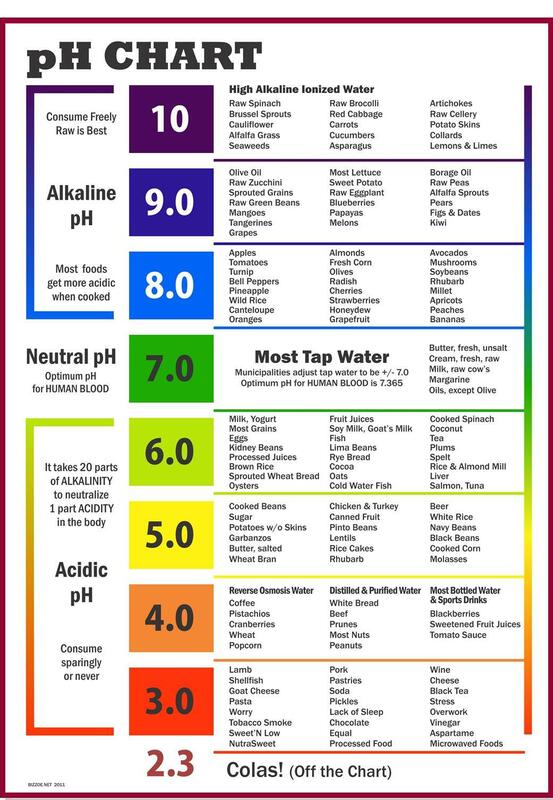 If the body is already alkaline, then calcium would be more likely to deposit in soft tissues. You can check your urine (not saliva) for pH using pH strips. The ideal urine pH is about 7.35 – 7.45, which is the regulated pH of the blood. Most people, especially cancer patients, are already too acidic. They should avoid processed foods, especially soda pop. Instead of taking calcium to alkalize themselves, they should indulge in alkaline foods: notably melons, cayenne pepper, carrots, cucumbers, and uncooked natural green leafy foods of all kinds (spinach, parsley, etc.). Visit our website at www.outoftheboxremedies.com. This entry was posted in Health and tagged Atherosclerosis, blood clot, blood pressure, Brazil nuts, Calcium, Conditions and Diseases, hardening of the arteries, health, Hormone, Lugol, Lugol's iodine, Magnesium, pH chart, Vitamins and Minerals. Bookmark the permalink. What I presented is not comprehensive – there are other causes for hardening of the arteries, such as fluoride ingestion. Thanks for your vote of approval. All i am new here and have registered to learn a lot more about this topic. Yes, I try to get to the point with good information. Thanks! Ik ben eigenlijk nieuwsgierig naar. I’m also curious about what leads to hardening of the arteries. This article covers some of the problems associated with hardening of the arteries. There are other problems as well, such as excess fluoride. Perhaps I’ll discuss the latter in a future blog.